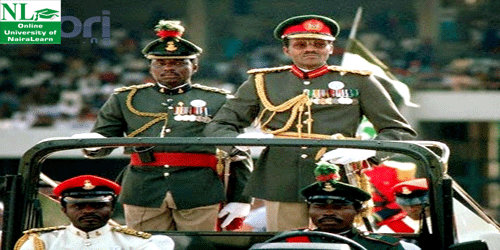 As usual, the Nigerian public welcomed news of a military coup d’etat and the overthrow of a Government they elected. The officers who led the coup-installed Major-General Muhammadu Buhari as Head of State, and as the Chairman of a new Supreme Military Council (SMC) In 1984. President Shehu Shagari was overthrown only three months after being re-elected for his second and final term of office in an election that was marred by accusations of electoral malpractice. Scarred by the memory of the mass bloodshed that followed the bloody military coups of 1966, the coup plotters wisely did not harm any senior Government figures. The only casualty of the coup was Brigadier Ibrahim Bako who was killed while trying to arrest President Shagari in Abuja. Some have speculated that Bako was the leader of the coup. If Shagari had taken a look at Nigeria’s history books, he would have noticed that the country’s military coups have almost always been carried out by the same group of soldiers. The young NCOs and Lieutenants that blasted Major-General Aguiyi-Ironsi from power in 1966, became Colonels that overthrew his successor General Gowon in 1975, and they became the Brigadiers and Major-Generals that overthrew Shagari. Had Shagari acted decisively early during his term and retired these men, his Government may have survived (the only notable senior officer retired by Shagari was Major-General Joe Garba – who had double-crossed his own brother in law during a military coup in 1975). Oversight of history and military postings played a part in Shagari’s downfall. Had he, in his position as the Nigerian Armed Forces’ Commander-in-Chief, paid more attention to sensitive military postings he would have noticed that many of the officers who took part in the coup were stationed in or in proximity to the country’s commercial nerve center in Lagos. Major-General Ibrahim Babangida, the Military Secretary: Brigadier Tunde Idiagbon, and a hitherto unknown brigade commander called Brigadier Sani Abacha. 0 responses on "Shagari Was Overthrown, And General Muhammadu Buhari Was Installed As Head Of State-Today In History"